On March 24, the kids and families of March For Our Lives will take to the streets to demand that their lives and safety become a priority, and that we end gun violence in our schools and communities. 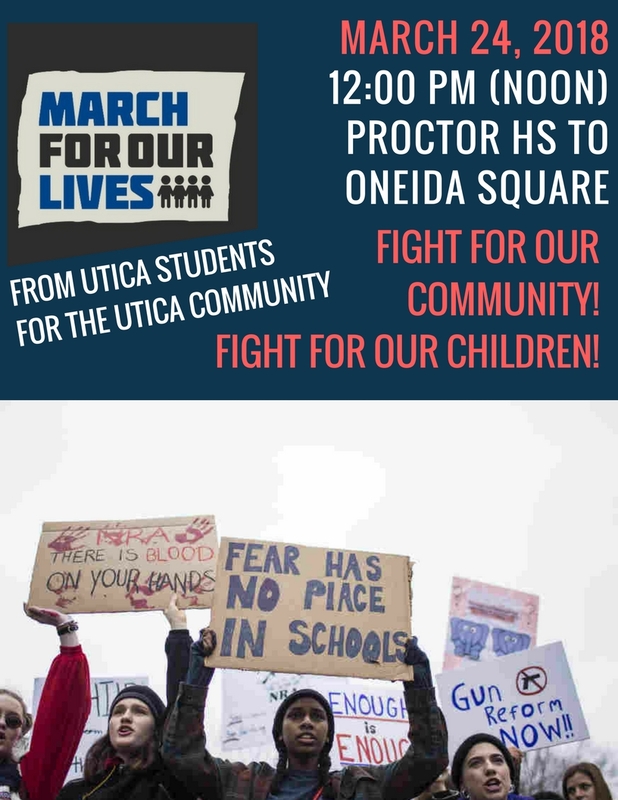 Here in Utica, NY, students are heeding the national call to action. Many of them will be marching from Proctor High School to Oneida Square on Saturday. The march kicks-off at Noon. March for Our Lives is a demonstration created and organized by #NeverAgain, a group of students who survived the February 14 shooting at Marjory Stoneman Douglas High School. Every town for Gun Safety, a gun control advocacy group, is helping the students plan and coordinate the event. Organizers are calling on lawmakers to address the issue of gun violence in American schools by implementing comprehensive gun control legislation. For more information about this national event, click here. 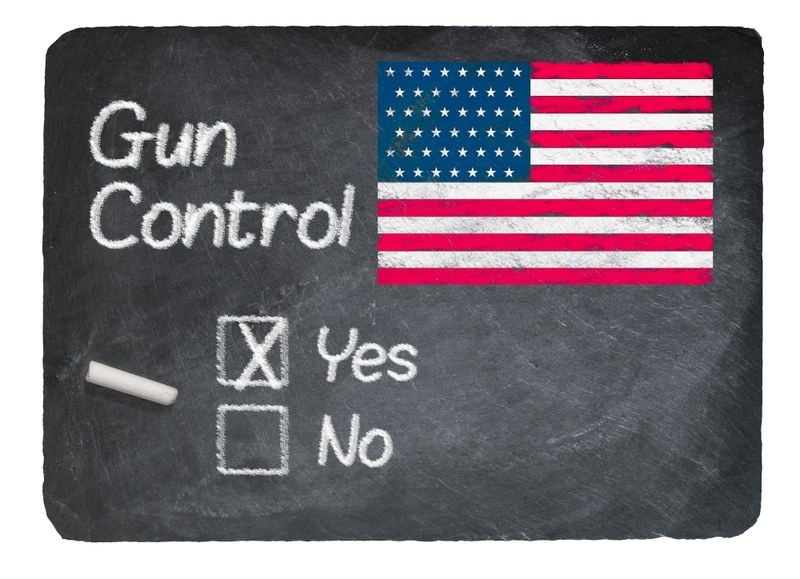 This entry was posted in Archives, Hot Topics, Politics and tagged gun control, march, march for our lives, proctor high school on March 21, 2018 by jlenoir. Editor’s Note: Amy Capetta has been writing health and lifestyle articles for over 15 years. Her work has appeared in Weight Watchers, Woman’s Day and Prevention, as well as on AOL, Redbookmag.com, TODAY.com and Yahoo Health. 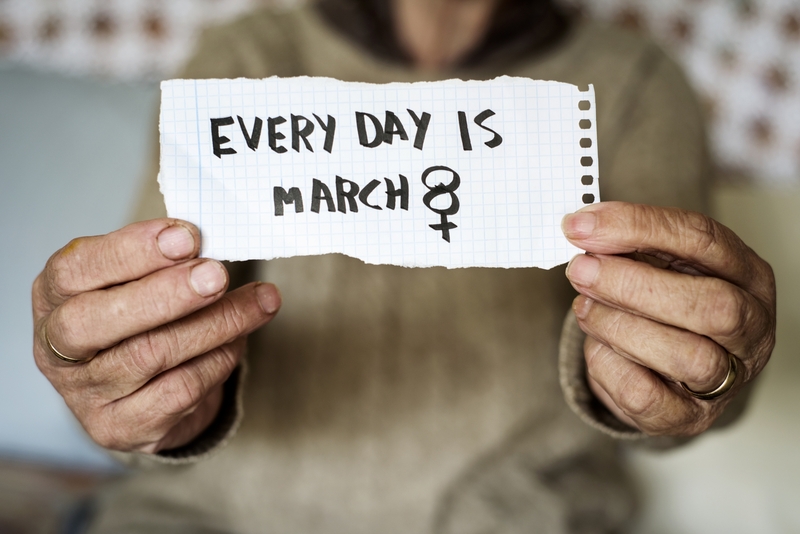 On Thursday, March 8th, people from around the globe will be celebrating International Women’s Day (IWD), an annual event that honors the various achievements—social, economic, political, and cultural—that females have accomplished. From Australia to America, women will be participating in marches, rallies, conferences, networking events, and online discussions to reflect on the advancements that have been made over time, as well as steps that can be taken in order to continue to promote gender equality. Here, we’ve highlighted the background of the day, this year’s message, how millions of women around the world will be encouraging greater diversity, and how you can take action on IWD. The first fight for women’s rights dates back to 1908, where 15,000 women took to the streets in New York City to protest for better pay, short working hours, as well as the right to vote. The following year, the Socialist Party of America declared the last Sunday in February as the first National Women’s Day in honor of the strike that took place the previous year. 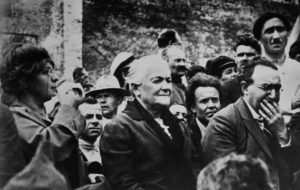 Then, in 1910 during an international conference dedicated to working women, a female named Clara Zetkin proposed an annual Women’s Day event be held on the same day in other countries around the world. It was a unanimous decision among the more than 100 women from 17 countries (which included the first three women elected to the Finnish Parliament). The first International Women’s Day was observed one year later by over one million women and men who attended rallies in Austria, Denmark, Germany, and Switzerland. And their cause had expanded—these pioneers were also protesting for women’s right to vocational training and to end job discrimination. Between 1913 and 1914, the date was changed from March 19 to March 8. The United Nations (UN) celebrated this annual event for the first time in 1975. 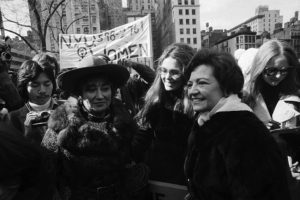 Gloria Steinem chats with the marchers in midtown Manhattan prior to the start of the International Women’s Day March in 1975. While empowering events will be taking place worldwide—including a story-telling and art exhibition charity in London, a night of music, poetry, and inspirational speeches at a theater in Windhoek, Namibia, and a six-day festival in the United Kingdom—some countries also have special traditions. For example, in Ukraine, Armenia, Moldova, and Russia, IWD is considered a national holiday where government offices, schools, and stores are closed. Women are gifted with flowers in Ukraine while men in Russia give females postcards that are designed with spring flowers, as well as images of a mother and child. And similar to Valentine’s Day in the United States, chocolate is a popular gift for women on IWD in Italy and Albania. Check the events page on the official site of International Women’s Day. Tune into a live webcast that will feature activists, celebrities (including Reese Witherspoon) and UN officials discuss ways the UN system and its partners can empower women from rural and urban communities. The conversation will take place on March 8, 10:00am-12:30 p.m. ET. Join Martin and three female innovators on a Facebook Live conversation hosted by Ernst & Young on March 8 at 12:00 p.m. ET. Ask your employer or human services department if your company will be honoring the day. Go to your local community’s website or Facebook page to find organizations and charities that may be hosting events, as well as businesses, restaurants, and stores that may be offering special promotions. This entry was posted in Archives and tagged amy capetta, international womens day, iwd, pressforprogress on March 8, 2018 by jlenoir. I love you. It’s not the birds and the bees and the 1,2,3’s… It’s much more than that. My love for you is cosmic, as if personally crafted just for me by Greek Gods aligning the stars. Granted I haven’t been to every city in the country but you’re my favorite by far. I love how your people talk. Their accents are like no other. From every “baby “and “sweetheart” and “good mornin’ everyone” greetings from strangers on the Trolley… I love you. I love the swag that’s all yours and how every “I got you” is as firm as a promise or a handshake. It melts my heart and restores my faith in the goodness of Man. NOLA I love you because you have a charm that traces her many roots to the days of Rose Nicaud, an eighteenth-century slave who’s enterprising vision to sell coffee as a street vendor is probably why Starbucks exists today, praline vendor Mary Louise who’s independent streak shaped your taste buds and food culture, Mr. Okra who sang the praises of his vegetables into the hearts and pots of your wonderful and incredibly hard-working people, and the first Creole nun, Henriette DeLille, who helped educate slave children when it was illegal to do so. Even living legends like, Dooky Chase, Trombone Shorty and the street musician with his washboard instrument who proudly tells folks he encounters about being in a music video with CeeLo Green create a sense of belonging in the deepest parts of my heart and soul. And, I love you for that. New Orleans, you are a magical place that reminds me of our collective muscle and mission as Americans. You’re the blueprint of the coming-of-age of America or the turning of a page in our cultural journey. When We were Us; working with great struggles—racism and inequality—toward that common ideal Hoover, JFK and even Obama talked about. Everyone working together to improve life in our country and to make their own American dream come true; whatever that is. New Orleans, similar to New York City, you make room for folks to express themselves and believe again. And, make money doing it too thanks to that charming allure that only comes from you, NOLA. Your glory brings people flocking to your streets practically begging you to take their money as if dazed by your voodoo love potion. Perhaps that’s why I love you too. I fall in love in many ways exploring your streets and your customs. Your black roots and especially your music foundation remind me of my own value, beauty and place in this world. It reminds me of my strong bond to a larger black culture. Still, I see myself in all the faces of your people. I see myself in the new immigrants struggling to speak a new language and having to swallow the intolerance of those with a long history in your bosom. I see myself in the exhausted faces of mother’s and father’s going to and from work, facing the onslaught of tourists seemingly without a care in the world and blind to the pain and struggles expressed in their sweaty faces in a still deeply segregated city. I hear the pain of senseless violence in my friends voice when he talks about the murder of his father. And unfortunately, violence is part of your identity as you sit rated as the 3rd most dangerous U.S. City. I sympathize with this harsh reality that impacts the most vulnerable of your people. I still love you. I see myself in the artists that flock to every corner of you, unleashing their natural talents for all the people to see. From the New Orleans Jazz Market to Bourbon and Frenchman Street, NOLA your people don’t disappoint when it comes to talent. And don’t even get me started with the drag queens! They represent the freedom that is unique to your people and I see myself basking in that freedom too. They make me feel fierce on solid ground. Then, there’s these amazingly strong women of comedy that make their rounds throughout the city making people laugh out loud, allowing me for just a moment, to forget all the woes of the world. I found myself in Black Girl Giggles, an all black female comedy group. All of these experiences make me love you. I saw myself in New Orleans. And, for a brief moment, I felt planted like one of your historic oak trees. I was home for the first time in my life. Perhaps it’s the nostalgia of my birth country Suriname that reminds me of home when I’m in your part of this vast world… it was a time when life was simpler, when there were no deadlines to meet, tests to grade, no future plans to ponder and worry about, no expectations to meet or live up to, and when life was happy. I guess what I’m trying to say is that I love you because you make me happy, again. I don’t remember where I left my happy but I’m grateful to have found it in you, New Orleans. Listening to the Trolley conductor on the 94 line berate all kinds of people— except the fumbling tourists—although made for a cringe worthy ride to the cemeteries, it reminded me of your flaws. Nevertheless, I love you because your flaws reflect the harsh realities of life and that there’s more humanitarian work to do. 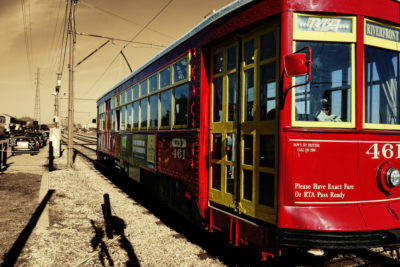 Even the frustrated Trolley conductor who exclaimed during his rant that, “the only good people in New Orleans are the tourists cause they’re the only ones here not trying to pull one over on ya’,” didn’t force a change in my heart but rather presented a challenge to see beauty where others don’t. I accept and love you, warts and all. Everyone has a unique story about their New Orleans. Some are romantic and wonderful and others share stories of the heartaches that you’ve caused. NOLA you’re not perfect. In your beautiful eyes, New Orleans, some only see pain, poverty and the brutality that comes with being poor. This uncomfortable truth is compounded by simply being born black. And yet, you go on singing, blowing your horns and dancing…charming revelers to join the processions of merriment that are symbolic of the joy you express in the midst of this pain and the harsh realities of life. 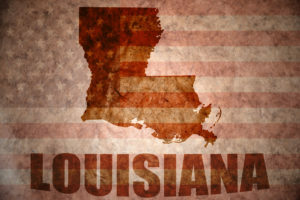 The story of New Orleans is the story of America. And the story of America is the story of race. And race is a vivid factor in New Orleans. It’s clear to see walking across Tulane and Loyola University or taking the St. Charles Street Trolley. You hear it in conversations shared without the guards of political correctness. It’s unapologetically expressed in jokes and with the uniquely black culture tradition called 2nd Line Sundays. Black people are free to be black and proud in New Orleans and conversations about race seem to be more prominent, and mostly accompanied with laughs and light-hearted banter. Blackness is celebrated despite the unequal economic playing field and the blatant racism being exposed in its bare sense across the country thanks to an administration sympathetic to this shameful part of our American story. And that’s a refreshing page turner for someone who calls New York home. I love you NOLA. I love how you’ve come full circle in our cultural journey, forging ahead with the promise and dream of Dr. Martin Luther King, Jr. and all those who have fought for a more just and equal country. From the days before and after Jim Crow, to the first black women innovators and the city’s first black and female mayor, LaToya Cantrell, from the food to the hospitality and music culture, and despite the noticeable divide amongst your charming people who take on each day like their hard-working ancestors, New Orleans there’s no city in the world like you. And as Kojak would say; who loves ya baby? You’re beautiful. This entry was posted in Archives, Culture and tagged black girl giggles, dc paul, i love nola, new orleans, nola on March 2, 2018 by jlenoir.